Discover the story of Newport’s geological, archaeological and historical development. Explore the Museum displays and find out more about Roman Caerwent, the Chartist uprising in Newport and life at the turn of the 20th Century. The history of the people who lived in this area is traced from the earliest evidence 250,000 years ago through to the twentieth century, and include the Beaker people, the Silures, the Romans, the Vikings and the Normans. The Social History collection in the museum reflects the everyday lives of people in Newport and the surrounding areas over the last 200 years. Themes covered by the collections range from domestic and personal life, education, religion and politics to local industrial developments and agriculture and include objects as varied as tools, household items to wartime artefacts, photographs and costume. The most significant collections within social history are the Transporter Bridge archive, which includes all the original designs for the bridge and photographs of its entire construction and the Chartist collection; weapons, broadsheets, silver and prints from the 1839 Chartist protest in Newport. The Art Gallery is dedicated to the display of oil paintings and changing exhibitions of a variety of media and themes. Discover the story of tea drinking in the John and Elizabeth Wait display of teapots and marvel at the range of ceramics collected by Iris Fox. Newport Museum & Art Gallery offers a variety of talks, events and family activities. Don’t miss the children’s area in the Art Gallery and the ‘fairy doors’ hidden around the Museum. 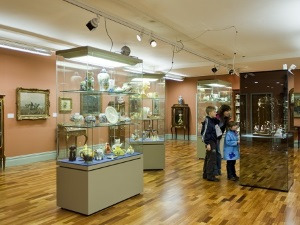 Visit the Museum's website to find out what’s on at Newport Museum & Art Gallery at the moment. Explore, discover and enjoy some amazing things! Explore Newport's history and discover the story of Newport’s geological, archaeological and historical development. The Art Gallery is dedicated to the display of oil paintings and changing exhibitions of a variety of media and themes. By Car : Newport can be reached easily via the M4. Car parking around Newport Museum and Art Gallery is limited and inside museum opening hours the Kingsway Shopping Centre multi-storey car park is the nearest parking option. Directions to the car park are signposted on all major routes around Newport. By Train: From the train station (city centre exit) turn left at the exit and walk past the taxi rank. Cross the road and follow the pedestrianised route to the main shopping thoroughfare, Commercial Street. Walking up the street turn left at Lloyds Bank down Llanarth Street into John Frost Square. The Museum and Art Gallery is immediately on your right (located in the same building as the library). By Bus: From Newport Market Bus Station walk alongside Newport Market to High Street. Turn left into High Street and continue along the pedestrianised Commercial Street. Turn left at Lloyds Bank down Llanarth Street into John Frost Square. Newport Museum and Art Gallery shares a building with Newport Central Library and is located immediately on your right as you enter the square.